Early last week, urban planning think tank TransitCenter tweeted a data visualization that presented a befuddling statistic: despite NYC’s growing population and record subway ridership, MTA public bus ridership has plummeted nearly 16% since 2002. TransitCenter’s research indicates that this remarkable decrease in ridership is a symptom of the “declining quality of bus service,” and the MTA Bus Time app is just one component of call to action spearheaded by public officials to rethink and turn NYC’s failing bus system around (TransitCenter). 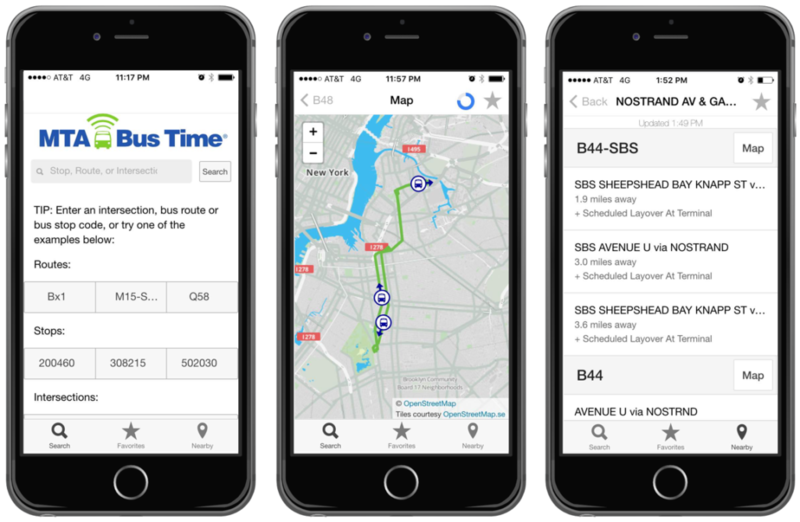 Available for iPhone and Android, MTA Bus Time uses GPS hardware to track and communicate the real-time locations of city busses so bus riders can meet the bus by viewing its location on a map, instead of wait for it. 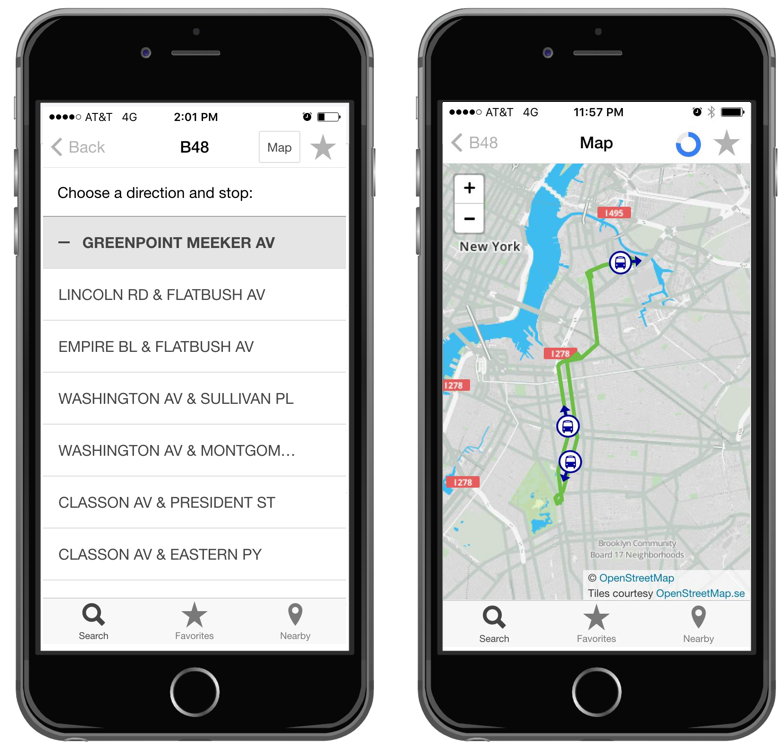 Bus Time was created to make taking the public bus more convenient, efficient and reliable for both faithful and prospective riders, and provide a seamless mechanism for finding “…information about when the next bus will arrive at your stop, even if you are still at home, the office, shopping, or dining” (MTA Bus Time Description). 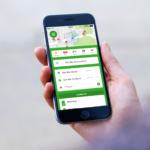 After choosing a bus line to track in real-time, users are moved to a screen that says “Choose a direction and stop:,” which provides the names of the neighborhoods and streets where the bus route terminates. In my example above, the directions to choose from are “Greenpoint Meeker Av” and “Lefferts Gardens Prospect Park,” each of which is paired with a “+” signifier to indicate that the option can be selected and expanded. 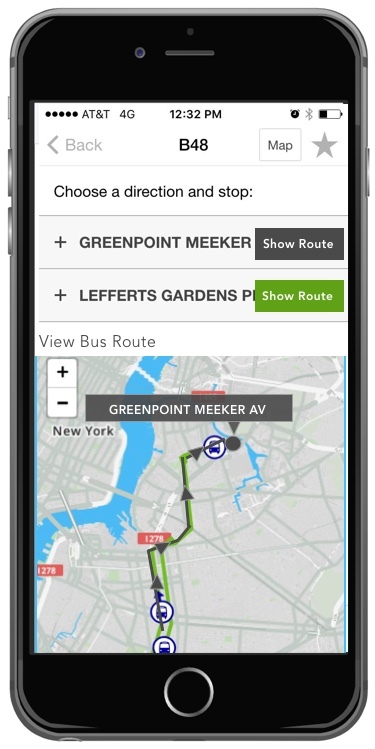 Seasoned bus riders who frequent NY transit systems know that a choice such as “Greenpoint Meeker Av” means that the bus route is headed toward Greenpoint. For many New Yorkers, this can be inferred because it’s a familiar model used by the subway system – a train that says “Bay Ridge” is headed to Bay Ridge, Brooklyn. That said, new or infrequent transit riders may read the options and think that the bus line begins at “Greenpoint Meeker Ave.” Furthermore, one would need to understand the geographical landscape of Brooklyn to know that Greenpoint is north of Lefferts Gardens. Without this declarative knowledge, it would be easy to make a knowledge-based mistake or a description similarity slip and select the incorrect route direction, thinking the bus bus is headed in the opposite direction or maybe even to an entirely different part of Brooklyn. 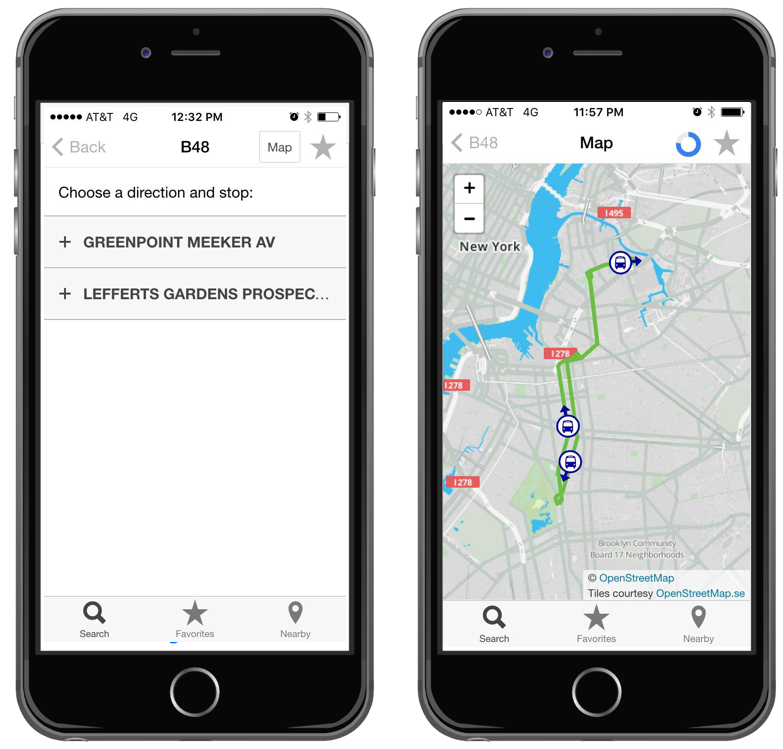 On this screen there is also a signifier called “Map,” which allows users to visualize the bus route and creates an expectation that this will help choose the correct bus route direction. 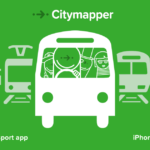 When “Map” is selected, however, the map only shows a real-time visualization of where the busses are located along a highlighted route, where neither the stops nor destinations are labeled. The map, while simple and by all means understandable, still does not help users understand which bus route direction to choose on a previous screen. One solution to a knowledge-based situation is to provide users a solid understanding of the direction in which the bus route is headed. In this case, that understanding can be achieved by affording users a way understand their destination when they select either “Greenpoint Meeker Av” or “Lefferts Gardens Prospect Park.” Perhaps instead of a button in the right hand corner that simply says “Map,” a map automatically appears beneath both selections. Then, an signifier can be added next to each route direction to “Show Bus Route,” which highlights the route, its direction, and its destination. This helps users visualize which direction they are headed, and where they will end up geographically. 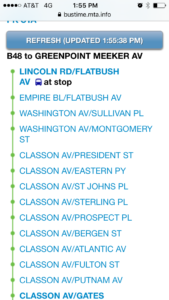 The bus stops displayed in the image above appear as list, but at first glance its unclear that the stops are in order by location along the bus route. In order to understand that the list is symbolic of a route, one would need to navigate to the “map” feature in the upper righthand corner, which displays busses traveling along an unlabeled path. There are no signifiers to connect the bus stops to their location on the map until the user descends one level deeper onto the individual bus stop screens. 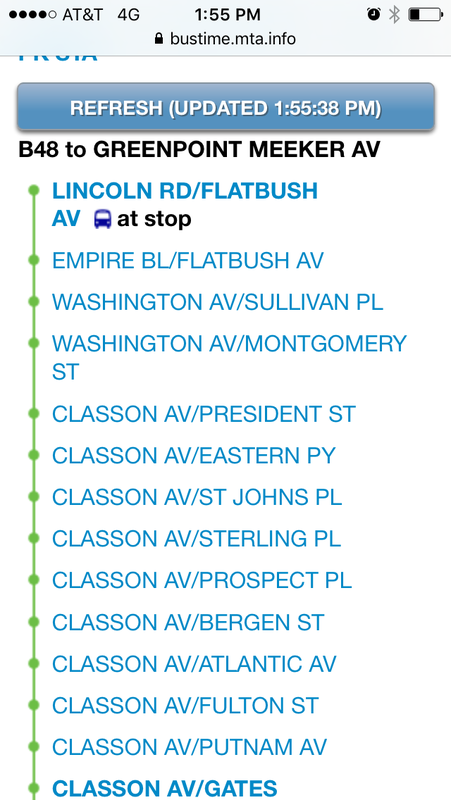 Despite bus stop list screen’s cleanliness and simplicity, the design lacks signifiers that call upon cultural conventions to convey that the we are looking at bus stops, listed in order, on the B48 headed toward Greenpoint. 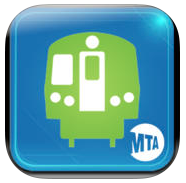 For example, on the subway, stops are usually placed along a line to indicate a “path” with dots or symbols along the way to represent each stop. The stop names are given context by the convention that routes and trajectory are displayed as lines, and breaks in that line symbolize stops. Below, an example from an MTA train car maps to the real-life model of the subway: the train follows designated path and makes multiple stops along the way. MTA Bus Time’s presentation of bus stop names as a simple list is meaningless without more contextual signifiers. 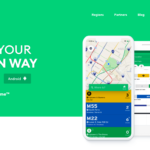 Add simple visual cues to the interface, such as a line with dots along it, to align with the cultural conventions established by the successes of public transit system around the world. Instead of displaying a sparse list of bus stop names, a presentation with these added visual cues conveys that the list is in fact representative of a bus line. The example below creates a familiar experience that clearly indicates the purpose and meaning of the words on the screen. An added signifier shows a bus icon “at stop”, pulling real-time transit information into the list to make it come alive and map to the conceptual expectation that busses are running along the route. This feature also eliminates the need to switch between screens to see where the bus is currently traveling along the route. 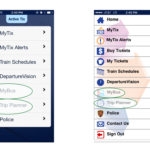 Interestingly, the display below is the desktop view of MTA Bustime, which has a radically different design than the Bustime iphone app. Issue III. Signifiers don’t always indicate the actions they suggest. 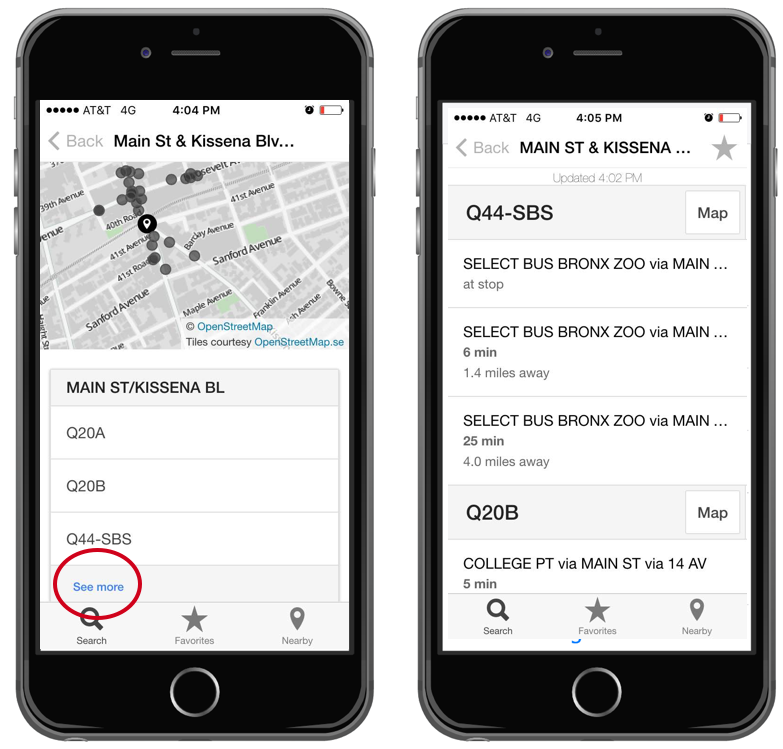 In the “Nearby” feature, there is an option to “See more” below the list of busses that service each bus stop. The signifier implies that there may be more busses that run along the route, and that by clicking “See more,” one can learn about additional options. Instead, the feature directs users to a screen with arrival information for each of the busses listed. This is just one instance of signifier failing to map to user expectations, and confusing the user by affording a result that was unexpected. The suggestion for this issue is simple – instead of “see more” at the bottom of the bus list, change the placement and text of the signifier to reflect the affordance more accurately. In this case, I suggest “See more” be removed, and a signifier with text that says “Check Bus Times” be placed next to each bus route on the list.